Dan Q: Clearly somebody doesn't want this geocache here because both the original and the replacement containers have been quite-obviously-deliberately buried under a block of concrete: that's some seriously-dedicated muggling! I've removed everything I can of the cache container and its assembly (unfortunately some remains under the concrete and I'd need a crane to lift it!). Wild Wolf Three's and Long Lost Zoo are still viable nearby caches if you're looking for some local history as you explore. This geocache is also described at geo.danq.me/wolf2. 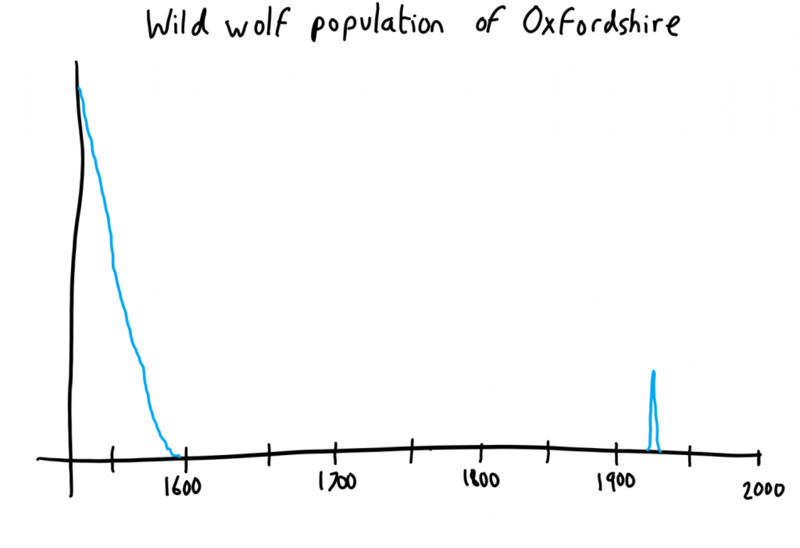 Wild wolves in Oxfordshire were driven to extinction in the 16th century, but made a tiny comeback for a few days in the 1930s. The second wolf made its way to Hampton Poyle where it harassed the livestock at a farm before being chased back towards Kidlington. You’re looking for a small container suitable for swaps and trackables on the smaller side: the laminated card within has more information on this escaped wolf. Please cross the nearby road carefully; use the crossing identified in the waypoints and note that there is no footpath (only a grassy verge) along this side of the road. Congratulations to Beechtrees for the FTF! Ng gur ehfgrq cbyr, chyy gur punva.